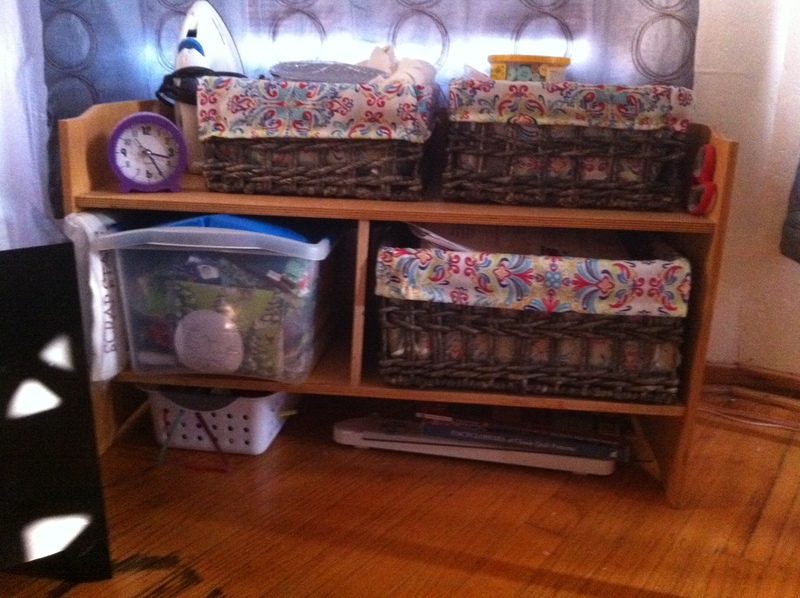 When I was working in an elementary school, it always amazed me how creatively teachers used scraps and leftover materials to organize their classrooms. I even had a coworker who saved tips of used-up crayons to melt down into molds to create new “rainbow” crayons! 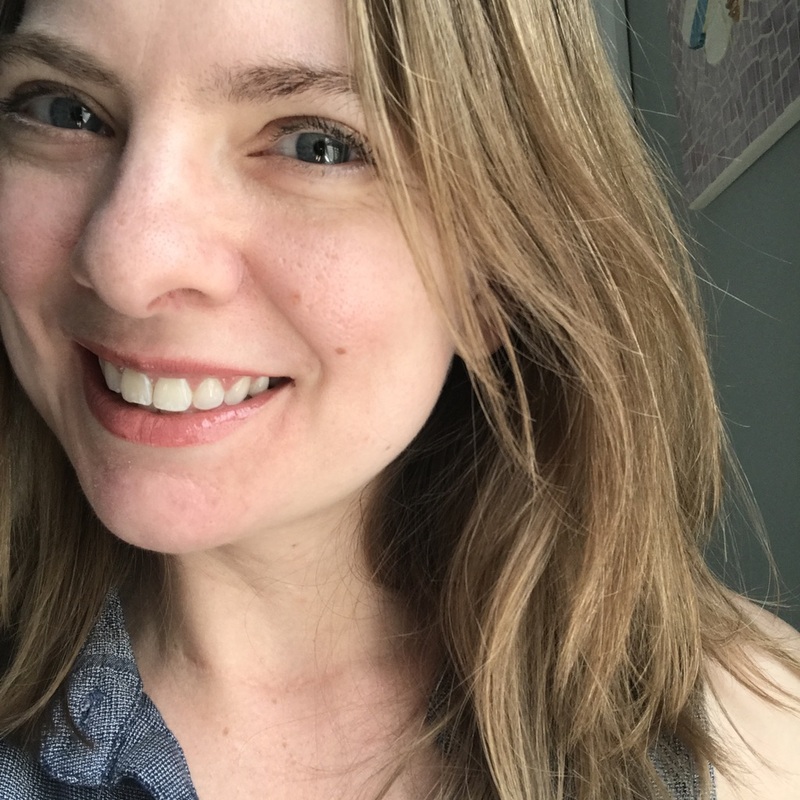 I try not to hoard scraps that I “might” use some day–I had to give away plenty of that when we moved–but I guess it’s hard to get rid of that mentality completely. 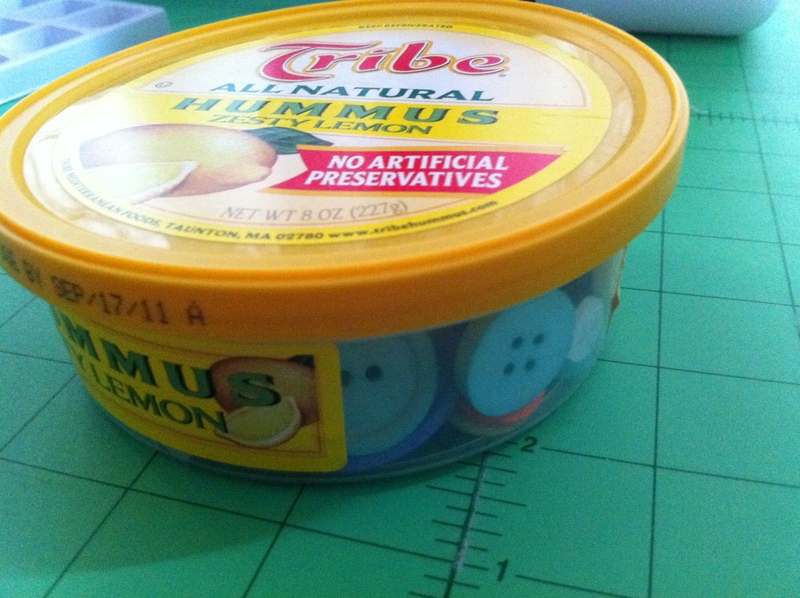 Sometimes old containers are just too perfect for new uses–take my new button bin, for example. 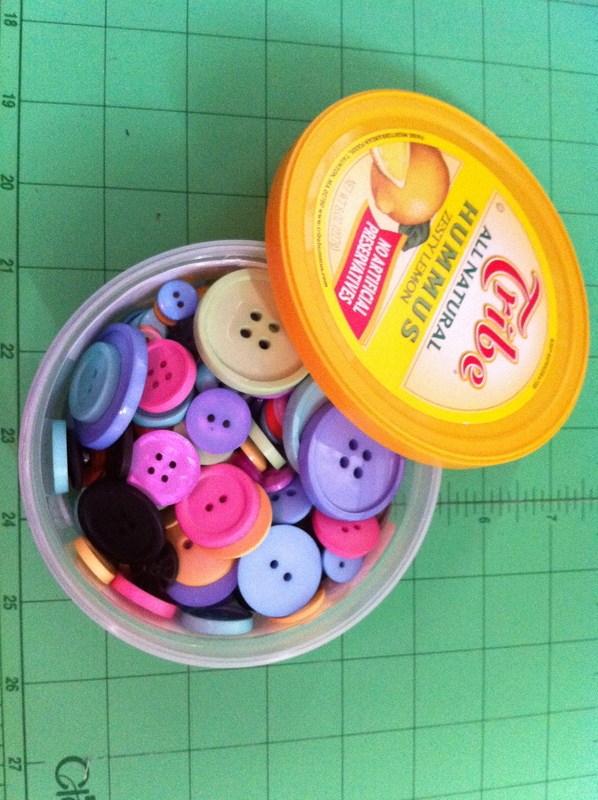 This tub used to contain greek olives from the olive bar at Whole Foods, now it’s home to my hand-sewing thread! 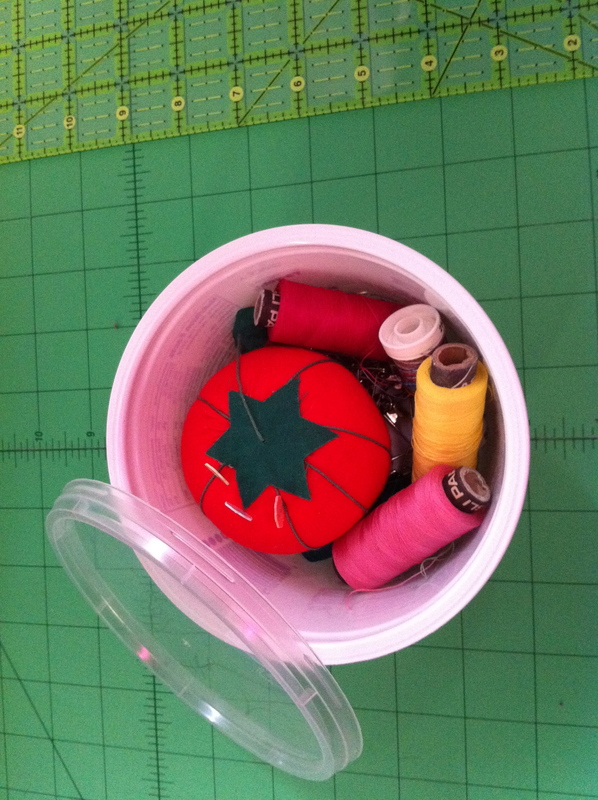 Now that the kitties are in SF, I have to be careful with my sewing supplies. 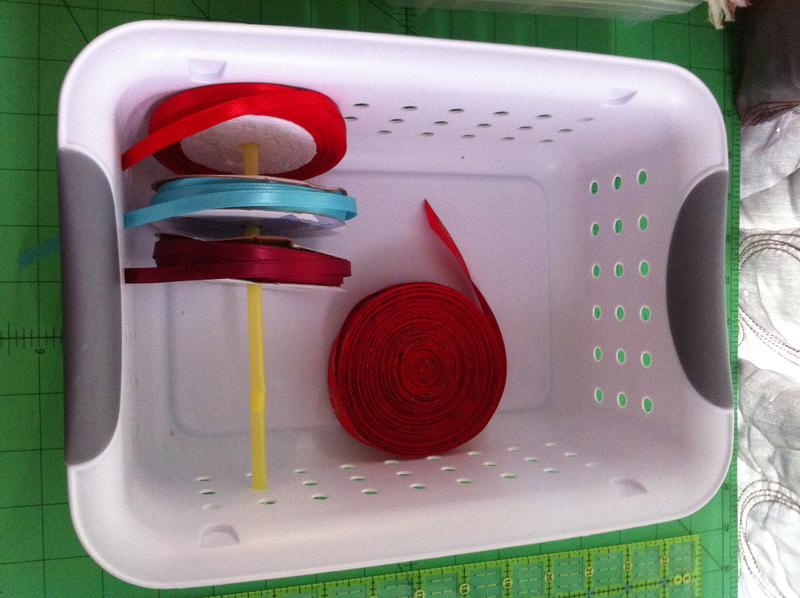 Not only do I not want Cora trotting off with a spool of thread, I also want the kitties to be safe. Giraffe in a Scarf had a harrowing experience last year when her dear kitty swallowed some string and had to undergo intensive surgery to save her life. 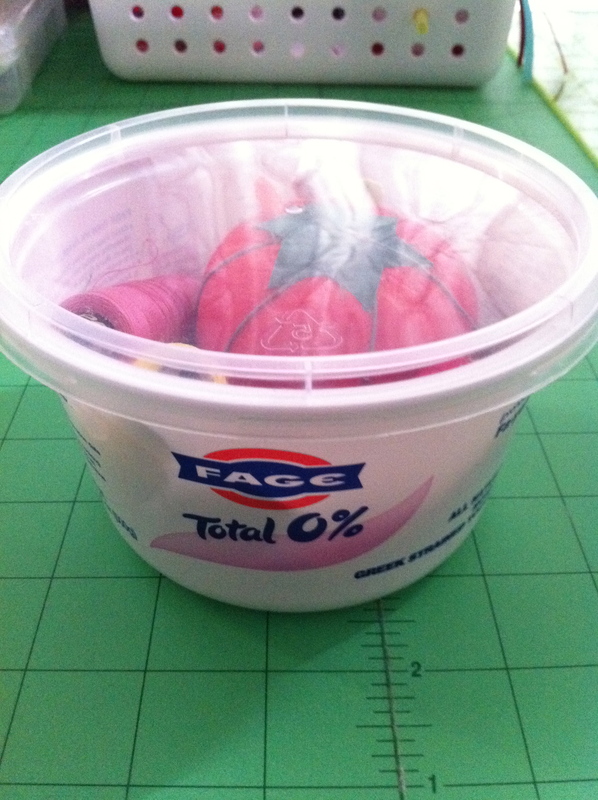 So these little tubs are perfect to keep potentially dangerous materials out of paws’ reach! 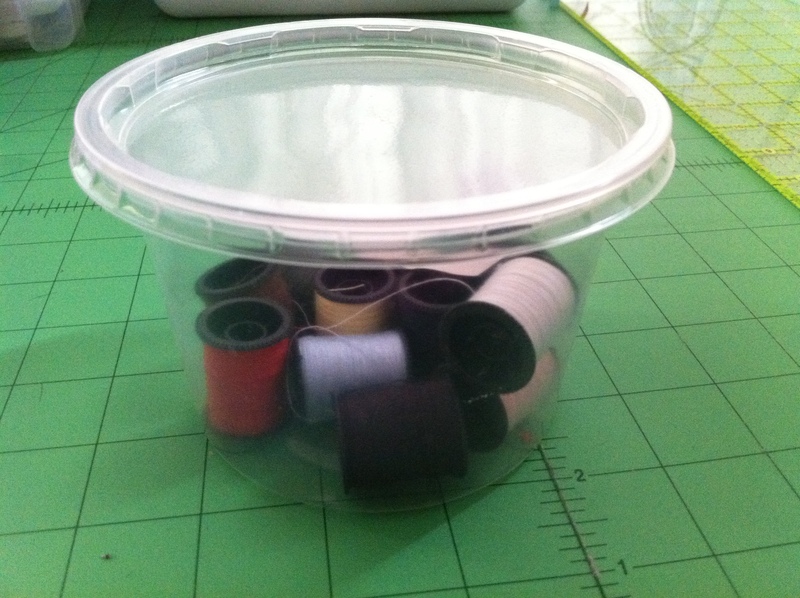 Whenever I’m working on a new project, I gather all my threads, pins, bobbins (etc.) into a tub and pop the top on when I’m done for the day. I don’t have to put up all my supplies when I’m taking a break, and the tub keeps everything in one place when I’m ready to start again. When I’m done with that project, I return the supplies to their designated storage. 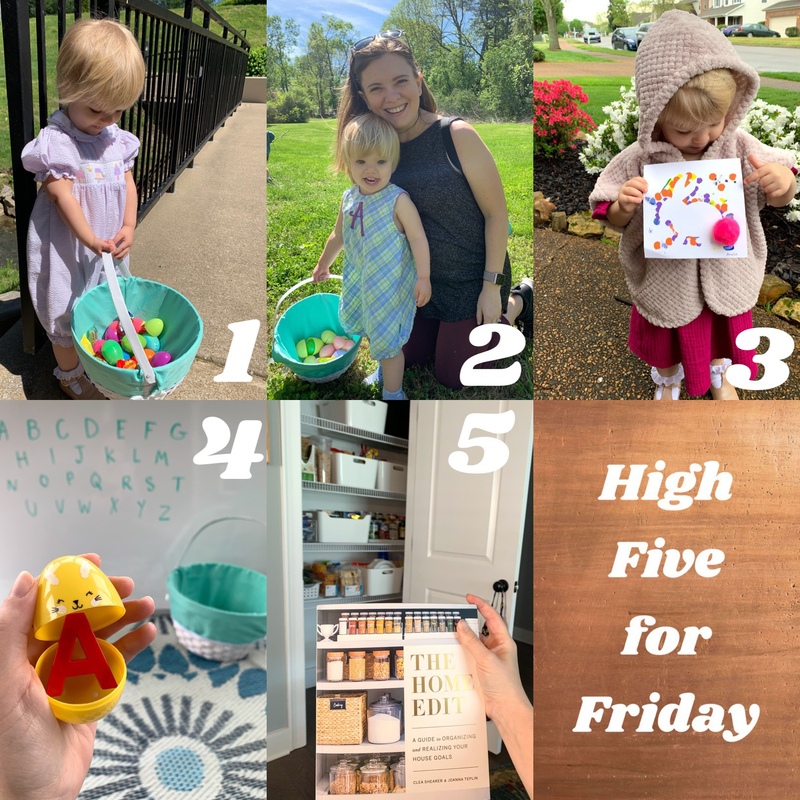 You can find these tubs with holes on the sides everywhere, in all kinds of sizes–I found this one for $1.99 in a local hardware store, and I’ve also seen them in grocery stores. 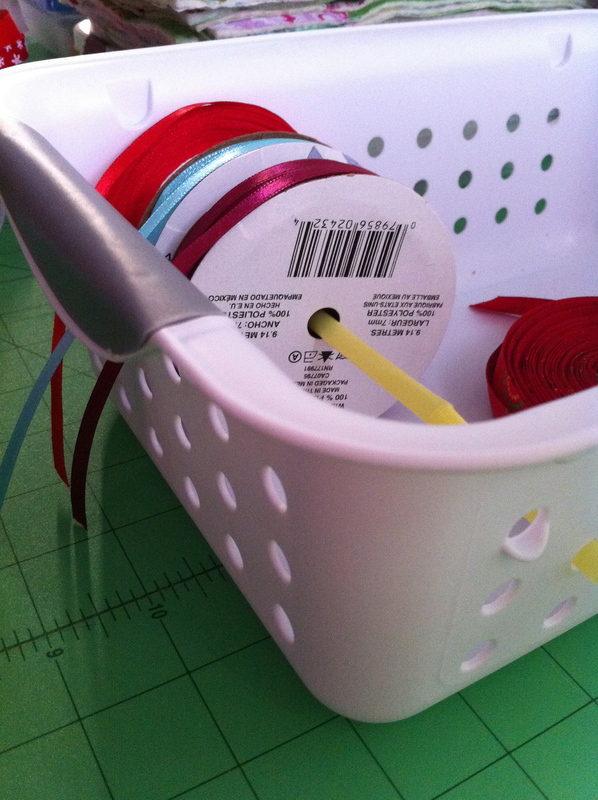 For ribbon on a spool, slide them onto a straw (or something similar, like a knitting needle, chopstick, etc. 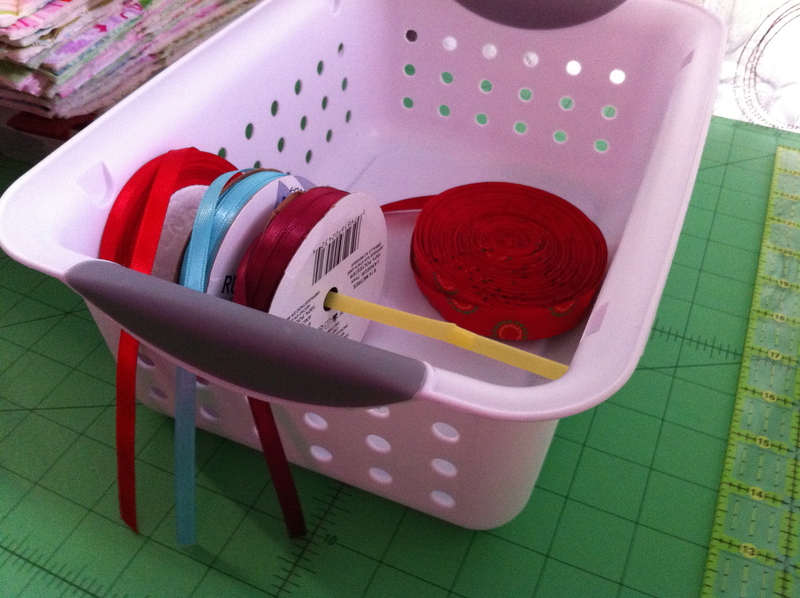 ), hang the straw between opposite sides of the tub, and then pull the ribbon out of a hole as you need it! 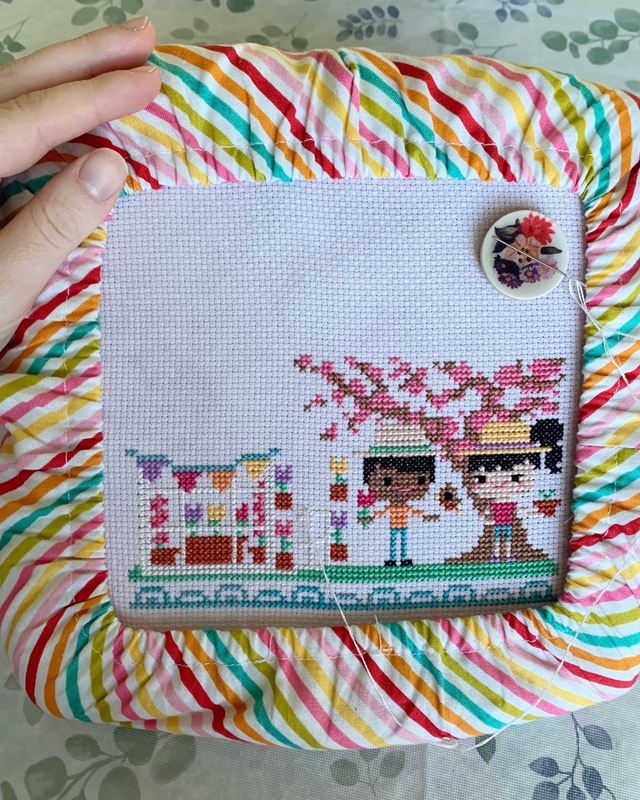 Ta-da, easy access to ribbon and it’s not all tangled up! 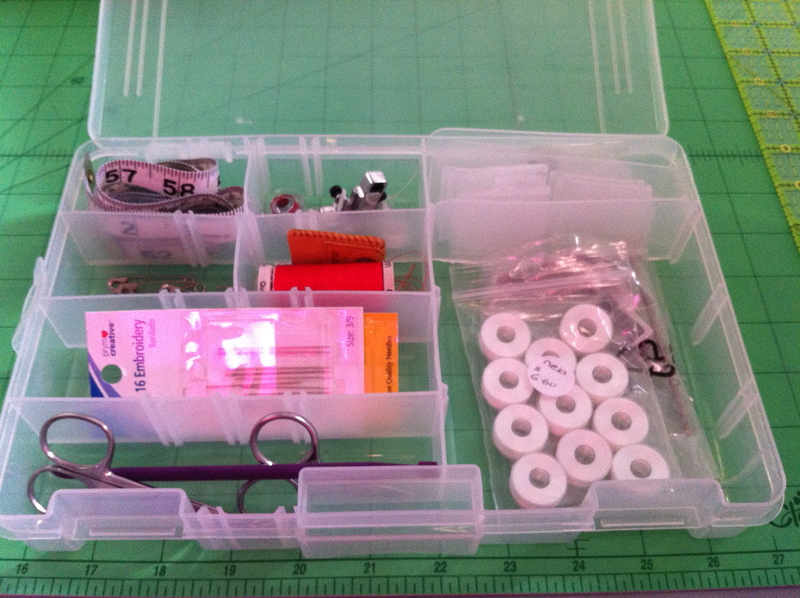 Tackle boxes! 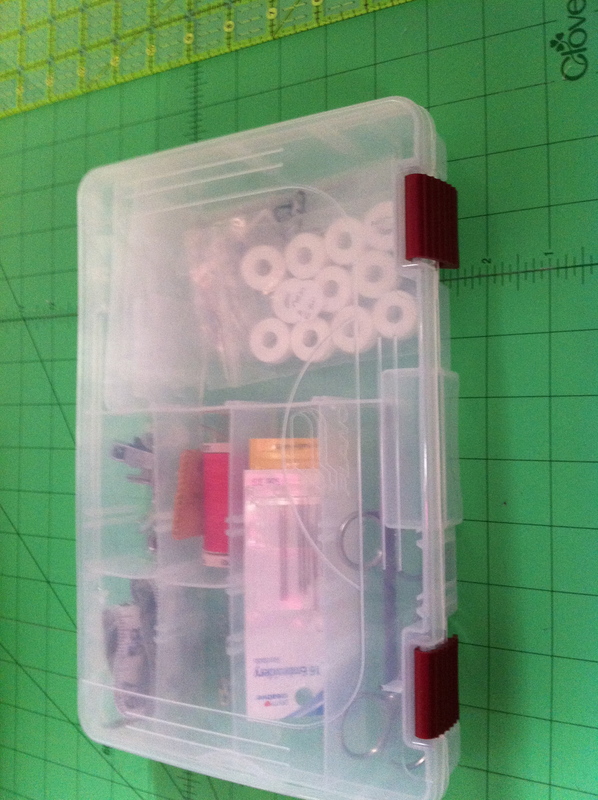 They’re a whole lot cheaper than “sewing” boxes, and you can customize your compartments easily. They snap shut, stack easily, and you can buy a few to hold a lot! 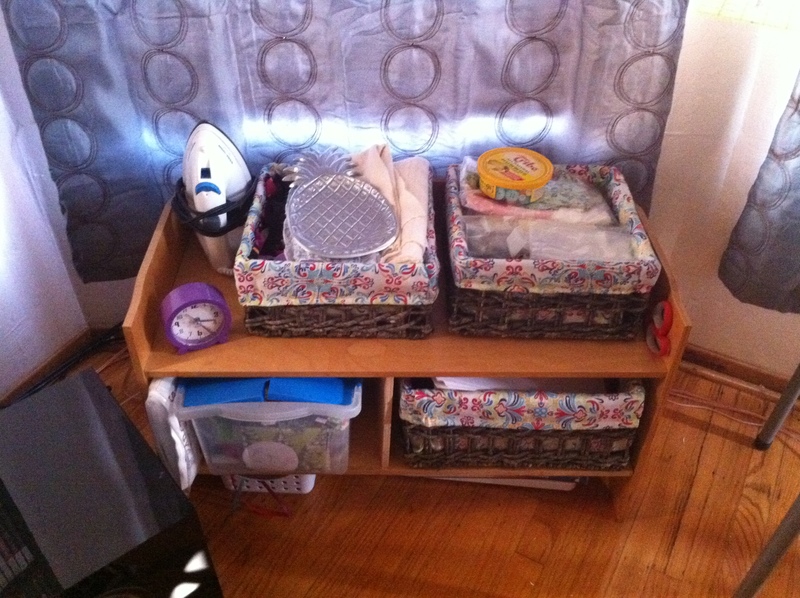 I love my craft storage–I blogged about this perfect storage unit that was being thrown out by the neighbors, but I don’t think I ever posted pics of the cute storage baskets my Mom sent in the mail. 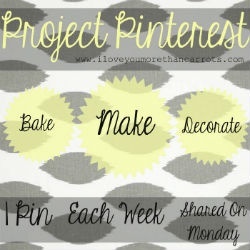 I’m linked up to Project Pinterest on I Love You More Than Carrots! Love the ribbon crate! And new (to me) curtains in the background. All of it very efficient , and cute to boot! 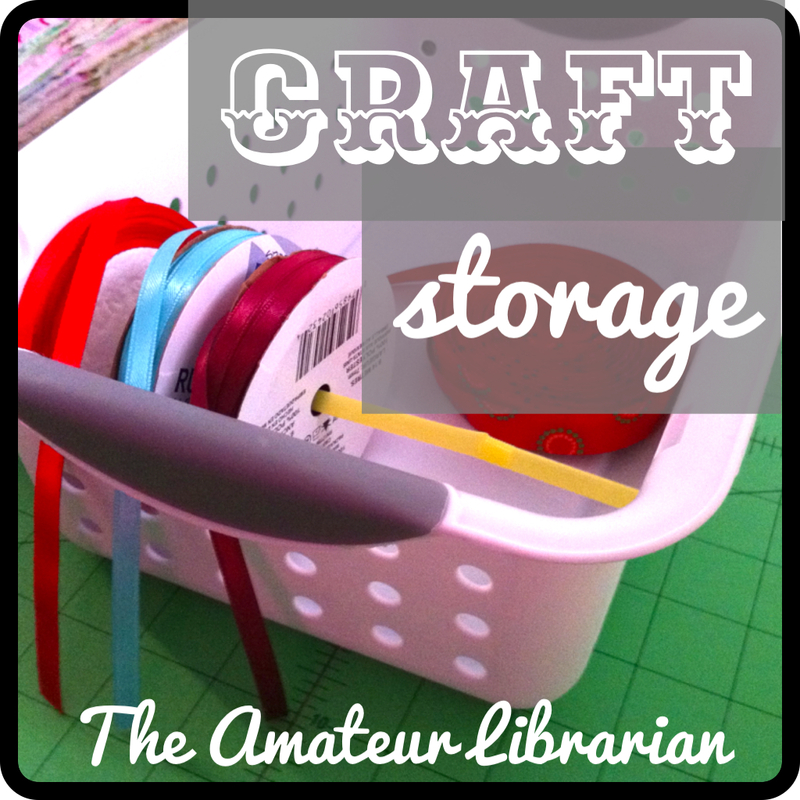 Without a craft room and TONS of craft stuff- this is perfect! I absolutely need to get started on something like this! 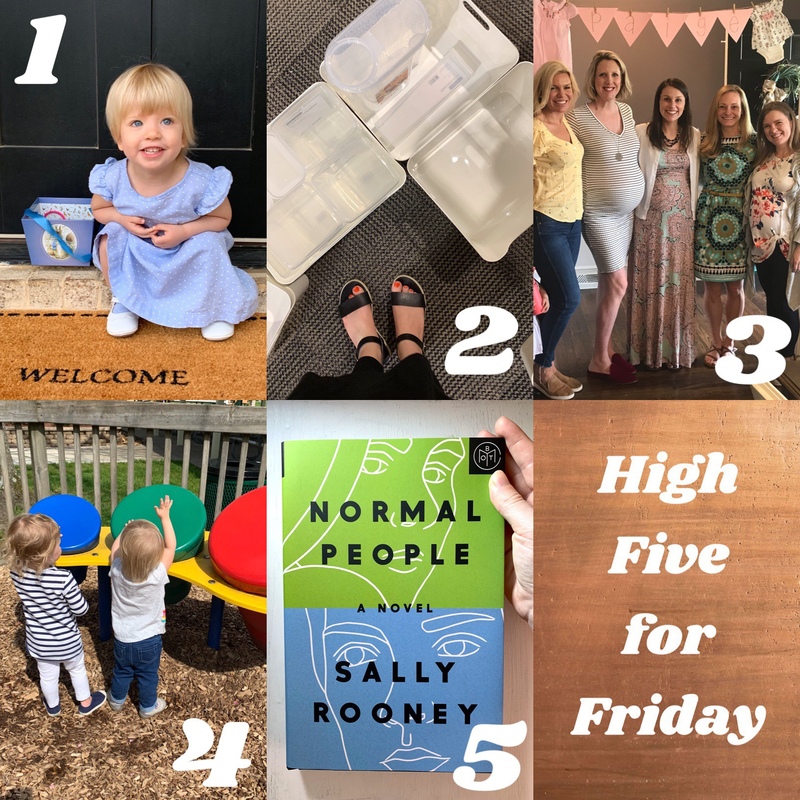 Thanks for sharing and for linking up!